Pre-movement activation of electromyographic spike activity of 201 neurons of field 5 was studied in cats trained to carry out a stereotypical act (lifting the anterior footpad to press a pedal) in response to a conditioned stimulus (experimental series 1) and without a conditioned stimulus (self-initiated movement, experimental series 2). In series 1, 69.2% of neurons were activated and 13.5% were inhibited before the movement. Prior changes in activity were also seen in intersignal movements, with activation of 40.6% and inhibition of 21.7% of neurons. 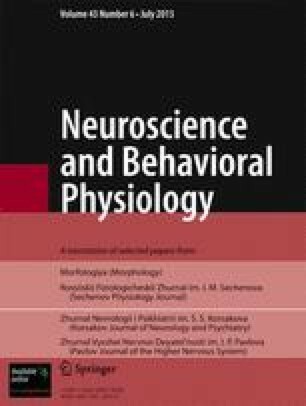 The time parameters of excitatory and inhibitory responses in both situations were similar, with pre-movement intervals of 19-1640 msec. In series 2, pre-movement inhibition was seen rather more frequently than activation (36.7% and 33.7% respectively). The earliest changes were inhibitory, occurring some 1800 msec before movements, while excitatory changes occurred only 880 msec before movement. These data indicate the involvement of the parietal associative area in the cat not only in executing, but also in preparing for different types of movement, including self-initiated movements, and that inhibition has an active role in this process. Department of Human and Animal Physiology and Biophysics (Director V. G. Sidyakin), Simferopol State University. Translated from Fiziologicheskii Zhurnal im. I. M. Sechenova, Vol. 81, No. 4, pp. 70–75, April, 1995.